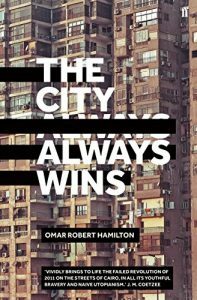 I hate straplines that say a book is heart-wrenching, but The City Always Wins is definitely that. A telling of the 2011 Egyptian Arab Spring, after its seeming early success, the novel is full of hope, horror and a painful sense of needing to keep wading on despite the impossibility of fighting those with all the guns (my echo of Macbeth is intentional; it’s as if attempting to change the leadership will always lead to blood and monsters). Like all summaries, this doesn’t do the novel justice. 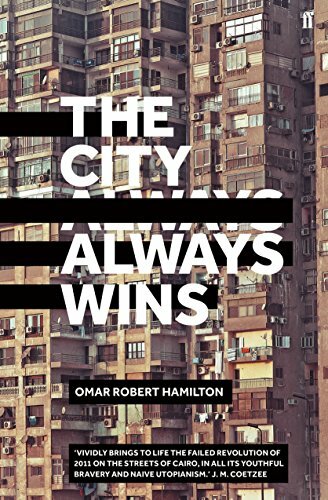 Mirroring the situation, The City Always Wins is complex, with multiple voices – not just of the central couple, Mariam and Khalil, whose lives we follow – but the voices of the parents of the martyrs killed in the first 18 days and endless tweets and texts, podcasts, snippets of internet and social media that helped to create and fuel the revolution. Indeed modern technology as a tool for connecting disempowered voices is explored. Khalil wonders if there is any point in continuing to use your voice to tell the story of the underdog, if no one is listening. As a founding member of Chaos, a media organisation set up to report and comment on the revolution, another member believes in the importance of telling stories regardless of the numbers of listeners; the stories can always be found if anyone looks for them. Who listens and how the countries of the world connect is also a central theme. Khalil is half Egyptian, on his mother’s side. His father is from Palestine. He was, however, born in New York. His nationality is constantly in question, even after he is shot in the back fighting for Egypt’s future. Identity, both personal and national, is questioned. Khalil feels he can never be accepted in Egypt and never claim anything but forgetting in New York where assimilation is another form of annihilation. A crane projects itself into the blue sky ahead. A mobile watchtower. Amsterdam and 125th. Harlem, Palestine. All around you it’s the same, every step wading into the eternal swamp of conquest and cleansing and murder. They’ll never stop chasing you, there’s no way out of history’s one long looping nightmare tripping through the dark bayou and it’s the things, you’re on the things and we want them: the army wants your land and the British want your oil and the Italians want your gas and the Americans want your airspace and your canal and your cimplicity and the Turks want your factories and the Australians want your gold and the Gulf wants your sweat and the Russians want your weather and the Japanese want your friendship and the Israelis want your name so there’s nothing left for you but to be gone. Gone, because we’re coming and first we’ll bring you war and you’ll run and we’ll seal iron chains around your neck and brand you with new names and drink your bodies in tea in your grandfathers’ houses and when we’re bored of war we will bring you peace and post-conflict resolution and interfaith dialogue and the United Nations and credit lines and television and when you choke we will grp your jaw firm in our hands and force open your mouth for structural adjustment and dialogue camps and off-Broadway plays and aid packages and first-party negotiations and mediated solutions and corporate social responsibility until your brain is reconfigured with our committee-designed computer-assisted algorithmically determined languages of unmeaning and you are stripped of all possibility of thought. The triumph of it all is the vanquishing of imagination. There can be nothing new. No new music is imaginable, no new genre, no new memories to repackage and sell, no new stories or ideas or possibilities, new new happinesses. There is only nostalgia and kitsch and superheroes and heartbreak and a sealed fate and surrender. There is no reality other than this one and no past that wasn’t marching towards it. They call it progress. It is undeniable, they tell us, it is all-conquering, it is this and it is now. The world is made. Countries are developed and other are not and so it shall be. A system is in place of such dominion there can be no imaging another. A system underpinned by a global network of trip wires, each tensed and primed to trigger self-destruction before evolution. Look around you. THere is no other world. There can be no other way. Surrender. There is only the now. Whisper it to your children at night. It would be better for them to accept it. And yet of course, there is the novel. It subsumes new media well. It uses multiple voices. It takes an old form, yes, but it pushes it and fights with it. You do feel defeated at the end, but you also feel compassion and a little sliver of hope and amidst all the political wrangling (that include interesting comparisons with other revolutions) the human story is not lost. How Khalil and Mariam fell in love and how the terrible events of fighting for a different Egypt starved their love of any oxygen to breathe as their knowledge of each other’s failings and guilt made it impossible for them even to touch, provides the painfully intimate heart of a novel of politics and ideas. This is a difficult novel to read, but more people should read it. There is a fever for dystopian novels, but this novel tells a story of our current world and it’s one we ought not to ignore. I’ve been away for a couple of weeks so I’ll be reviewing Such Small Hands by Andrés Barba very soon and watch this space for news of a book give away – Heidi James’ latest novel So The Doves published in September – later this week.